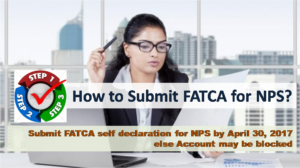 How to Submit FATCA declaration for NPS? How to Submit FATCA declaration for NPS to prevent it from getting Blocked? FATCA declaration for NPS can be done Online now – Click to Read! Later in the day subscribers also received from NPS [email protected] on their registered email with Subject: “Submission of FATCA Self-Certification Form for your PRAN under NPS”. Have reproduced the mail below. A few hours back received below mail from NSDL. The accounts would not be blocked on account of non-submission of FATCA Self-Certification. PFRDA / NPS Trust will issue revised guidelines on FATCA shortly. 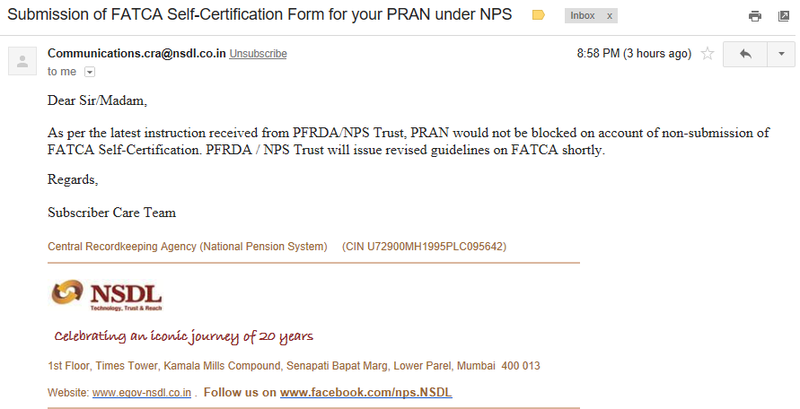 So NPS subscribers should wait until further instructions. NSDL handled this entire thing in worst way possible – some heads should roll! FATCA is Foreign Account Tax Compliance Act, a law enacted by USA in 2010. According to this law, any individual who is resident of USA (citizens or green card holders) or financially connected to the US or have any tax residency in US have to declare all their foreign income and investment details to US Tax Authorities. The law was enacted to prevent tax evasion through offshore investments by US residents. India is signatory of the above law and hence all the financial entities like Banks, Insurance Companies, Mutual Funds, Brokerages, etc have to furnish their client information to the Indian Government, which in turn would share it with US Government. In case you have no income connection with USA, you are not impacted but still need to give the declaration. Unfortunately PFRDA the regulator for NPS did not bother to inform its subscribers about the FATCA requirement until the very last minute. But regulations being regulations this is what we need to do. Only people who have opened NPS Account on or after July 1, 2014 are impacted. But with tax incentive on NPS coming in 2014 there would lot of people who opened NPS account and would be impacted! To comply subscribers would have to submit a self-certification (i.e. 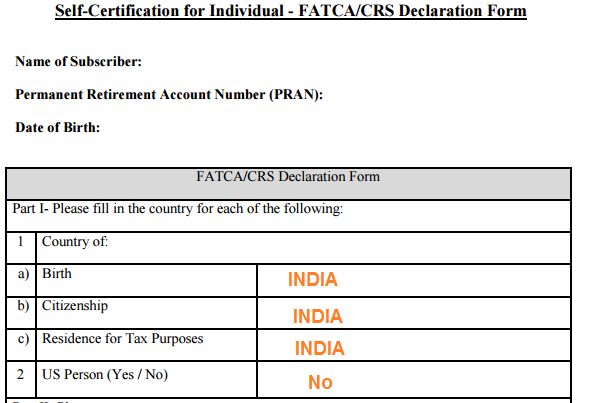 FATCA/CRS Declaration) to NPS Trust. 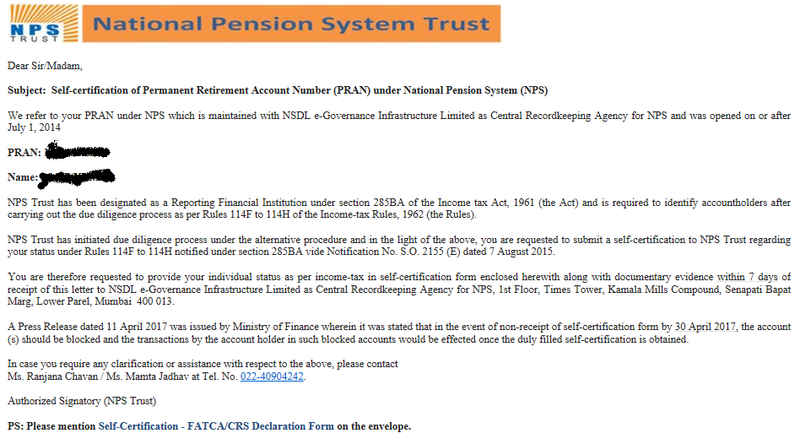 Step 1: You can download the NPS FATCA Self Declaration Format by clicking here or from the email you received. In case the above filled self declaration NPS FATCA form is not received before April 30, 2017 the NPS account would be blocked. The account can be activated only after subscriber submits the above form. 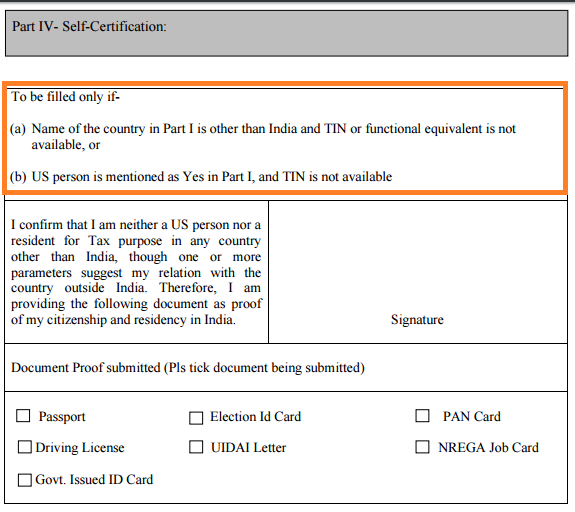 How to fill NPS FATCA Self Declaration Form? The FATCA form is 3 page form divided in 4 parts. In case the answer for 1 above Country of Birth, Citizenship and Residence for Tax Purposes is INDIA, you just need to move to Part 3 for signature. This hopefully would cover majority of NPS subscribers. 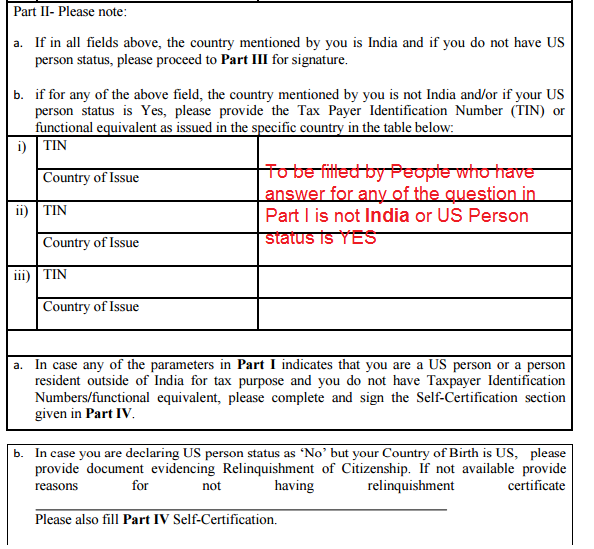 In case the answer for any of the above is not India or US Person status is YES, you need to provide Tax Payer Identification Number (TIN) or functional equivalent as issued in the specific country in the table. Also Read: 6 Changes in NPS Rules in 2016 & How it Impacts You? Part III just requires your name, signature and date and is to be filled by everyone. The subscribers would in this case have to provide any of the below mentioned as proof of citizenship and residency in India. 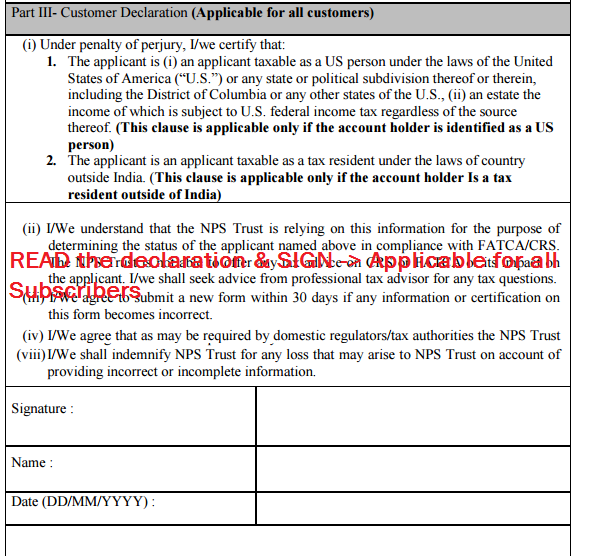 The entire approach by NPS/NSDL to obtain FATCA declaration is going to create lot of issues for subscribers. I do not understand why this could not be done online as was done by Mutual Funds earlier. Also there is NO way subscribers would be able to send the FATCA self declaration forms on time. Even in case they do NPS CRA would not have the ability to process the deluge of forms! Anyway as subscriber send this FATCA Self declaration as soon as possible to prevent any problem in future. I tried to create NPS account online. But FATCA section is confusing. Few blog say in order to submit FATCA details you will require PRAN number. But Once will get PRAN number once NPS registration is complete. But for NPS registration itself FATCA details are mandatory. Above process is cyclic with no proper guidance to proceed ahead. P.S: Already tried to reach 022-40904242, but no one respond.